Cisgender-straight-white-male privilege was on full display as the Alt-Patriots lulled the indigenous American-inspired football team into a false sense of security all the way into the 3rd quarter. Then BOOM, in a way that we haven’t seen since colonialism, the Alt-Patriots pulled out their white privilege and literally oppressed the Falcons all the way to the endzone, 4 times. We are better than this America. We need to channel our anger to something productive. These few weird tricks will ensure that the Alt-Patriots are de-certified as Superbowl Winners and we can restore our Superbowl Integrity. The Falcons were leading for over 3 quarters. That has to count for something! The Falcons had more yards per play, both passing and rushing. The Falcons defense scored more points. Most importantly, over the course of the 16 regular season games in the 2016 Election, er…. 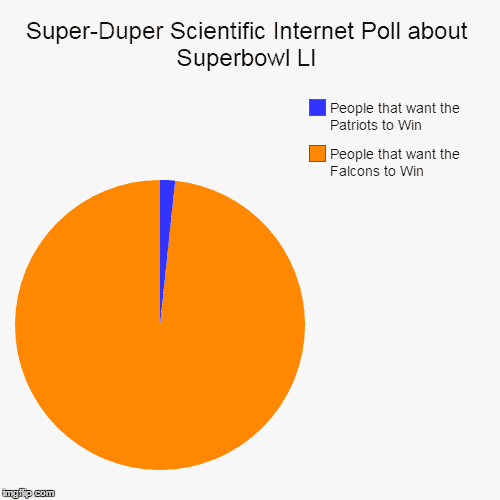 Superbowl LI, the Falcons were clearly the statistically better team. So what if the only time they went to Pennsylvania, Michigan, or Wisconsin resulted in a big loss. The Falcons inability to perform in Philadelphia should NOT have changed the outcome so drastically! We need to change the rules of Football post-game and prevent the Superbowl results from being certified by the NFL. Call and e-mail your team owners. Put on a silly hat and march on their headquarters. Break some windows at Starbucks. Mount a deflated football on your chest as a sign of solidarity with the Falcons. 99% of the Country was rooting for the Falcons. I know this from a highly scientific and valid chart that I saw on the internet. This chart was NOT made 5 minutes ago by the author. Obviously.